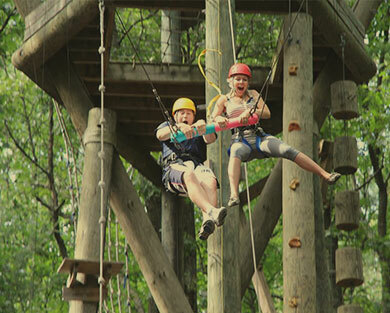 Leave routine behind and embark on an unforgettable adventure with your team at Tamarack Adventure & Retreat Center. For decades, we’ve worked with adult and corporate groups to enhance teamwork, communication and trust among members. With an 85 percent return rate, the majority of customers come back year after year. We are a retreat center like no other. 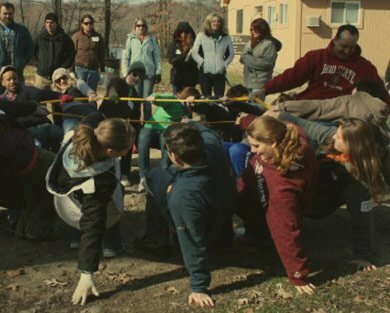 From the cabins to the activities and comfortable and campy atmosphere, your team will go into the retreat and come out stronger afterward! 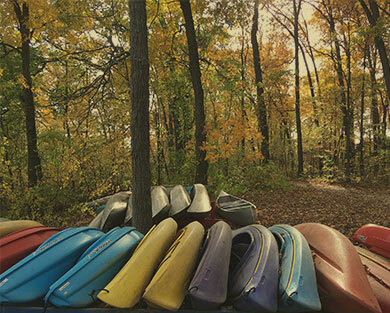 Groups of all sizes regularly visit Tamarack Adventure & Retreat Center. Whether you’re interested in coming for a few hours or a couple of days, we’ll help you push boundaries, build memories and achieve your goals during your stay. We partner with you to create programs that bring your group into a better understanding of each other. Our more than 50 adult programs can be mixed and matched to meet your group’s specific needs. Explore some of our most popular options below. 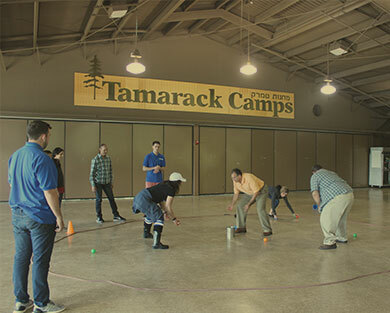 Tamarack Adventure & Retreat Center offers over 50 engaging programs to meet every group’s goals. Call us to learn about additional activities at 248-647-1100. A fantastic culmination to your Tamarack adventure, Community Puzzle allows members to debrief and reflect as they customize puzzle pieces to express their unique experiences at camp. As a team, you will hoist two participants at a time 45 feet in the air before releasing them for an exhilarating swing ride across the forest. 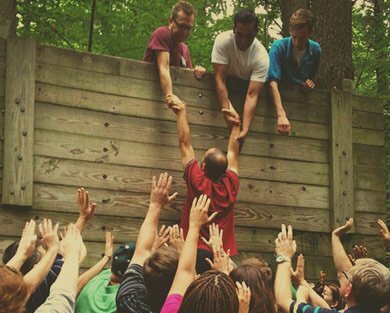 Build trust, teamwork and camaraderie with your group. One of our most popular programs, Group Initiatives encourages team members to work together and communicate to solve a series of challenges. Get your group up and moving to make team members feel more comfortable with each other in a safe and supportive setting. 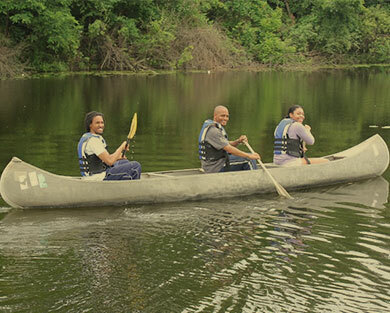 Explore Phipps Lake, learn new kayaking and canoeing skills, play games with your team and connect with nature during our beautiful kayaking/canoeing program. An American Red Cross-certified lifeguard will ensure safety on the water through the entire duration of this activity. Based on the hit TV show, Minute to Win It gives participants 60 seconds or less to solve assorted challenges. This engaging program is sure to energize your whole group. Group members will practice precise communication as they attempt to rebuild a Lego “monster” from memory. 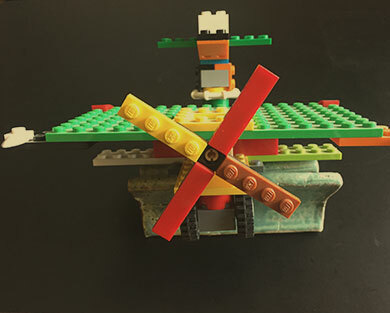 Each teammate will have a specific role in creating the Lego monster and, often, some comic relief. 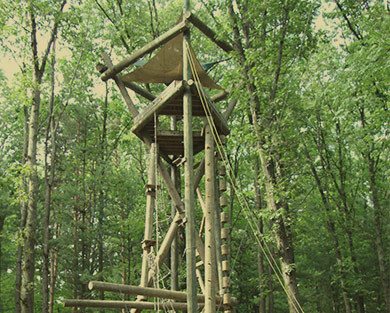 Conquer our 40-foot climbing structure, including five vertical challenges and eight climbing routes, with the help of emotional and physical support from your team.